As revealed today at New York Comic-Con 2015, Valiant Entertainment and the Certified Guaranty Company (CGC) are proud to announce an all-new, first-of-its-kind collaboration…the VALIANT x CGC REPLICA VARIANT SERIES! Beginning in January 2016 and continuing throughout the year, Valiant’s most high-profile new releases will debut with VALIANT x CGC REPLICA VARIANTS – the first in a fun-filled new line of shelf covers spotlighting the heroes of the Valiant Universe in printed reproductions of CGC’s trademark grading cases…and capturing their thoughts in the process! Featuring the artwork of New York Times best-selling creator and Valiant superstar Clayton Henry (ARCHER & ARMSTRONG, HARBINGER WARS), each VALIANT x CGC REPLICA VARIANT will feature an ink-on-paper reproduction of a CGC “slab” with a different Valiant hero preserved for posterity! “CGC is always looking for new and innovative ways to work with publishers in the industry. Valiant’s approach to incorporate our product and service into comic books themselves presented a wonderful opportunity for us to reach fans in a new way,” said CGC Director of Operations Harshen Patel. 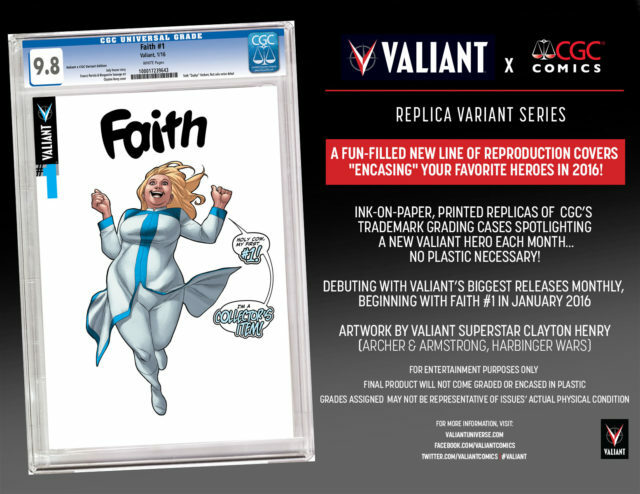 Beginning with the debut of the FAITH #1 (of 4) VALIANT x CGC REPLICA VARIANT in stores January 2016, each VALIANT x CGC REPLICA VARIANT will be available for retailers to order in unlimited quantities and will be made available at Valiant’s standard suggested retail price. Printed on Valiant’s standard paper stock, the VALIANT x CGC REPLICA VARIANTS are for entertainment purposes only and will not come graded or encased in plastic. Furthermore, the grades assigned on the printed copies of each VALIANT x CGC REPLICA VARIANT may not be representative of the issue’s actual physical condition.